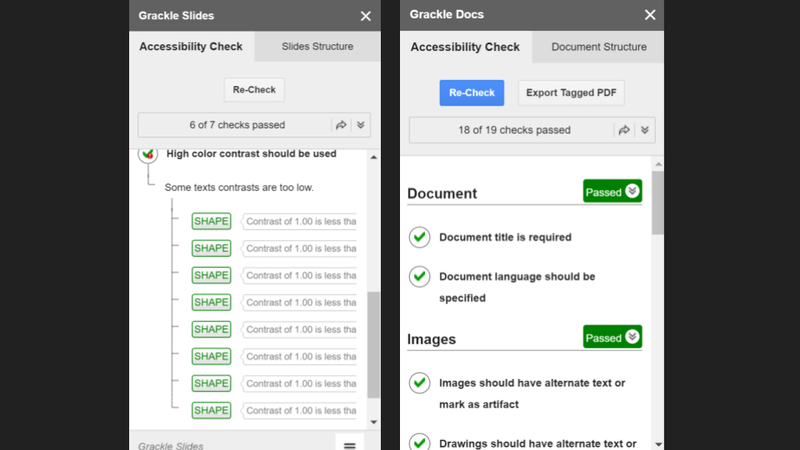 Grackle is a service that will check your Google Documents, Slides, and Sheets for accessibility. It is available as an Add-on for Google Docs, for Google Slides, and for Google Sheets. With the Add-on installed Grackle will run a check for visual accessibility then make suggestions for improvements. When you run Grackle's accessibility checker it will identify places where your document, slide, or sheet doesn't meet accessibility standards. It makes suggestions for improvement on the areas in which your document, slide, or sheet doesn't meet accessibility standards. Some of the suggestions can be implemented with just a click from the Grackle Add-on menu while others are changes that you will have to make yourself. For example, if your document lacks a clearly labeled title, Grackle will suggest and let you implement a title with just one click. Changing the color contrast is an example of change you would have to make manually. 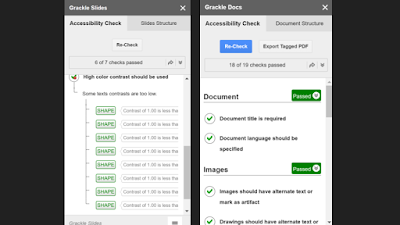 Grackle could make it quick and easy to ensure that your documents and slides meet your students' accessibility needs. In addition to using it myself, I would consider having students use it on their Google Slides presentations just to help them evaluate their color and font choices.